Alex Pro Pressure Washing is a top-rated provider of residential pressure washing and exterior cleaning services in the Central Florida area. Our goal is to make our customers happy one job at a time by restoring, brightening and protecting their property against damage caused by weather and time. Call or message us now for your free consultation and quote from one of our dedicated professionals. When you select us for your home improvement needs, we bring a host of benefits beyond any other power/pressure company or contractor in Orlando. We also serve all of Osceola, Seminole and Orange Counties including pressure washing in Winter Park, Altamonte Springs, Oviedo, Longwood, Kissimmee, Winter Springs, Loch Haven, College Park, Thornton Park, Baldwin Park, Windermere, Winter Garden & more! Alex was extremely courteous, professional and friendly. He went right to work using up-to-date pressure washing equipment and worked hard to clean my patio and pool cage. It came out looking great. I also added a chemical retardant to help prevent future mold and mildew build-up. It left everything looking and smelling super clean. I can highly recommend Alex and his pressure washing business and would use him again. Alex was great!! Did a great job & answered all my questions. I’m so happy & my home looks great! My go-to guy for pressure washing, thanks so much! Alex was outstanding! He came over right away to check out the job and pointed out some other places that could use cleaning, which we added on for a nominal charge. Alex arrived on time to do the work, was quick, thorough and with a fantastic attitude. We’ll be giving his name out to all our neighbors! Our home looks so great it almost looks like we repainted our home! 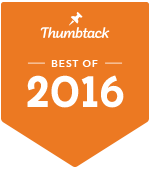 We have been recognized by Thumbtack, an online service featuring more than 230,000 professionals for hire, for superior work and consistently high customer ratings. Visit us there for more information. Ready for a free consultation or interested in our prices? Get in touch with us today to discuss how we can improve the appearance of your home's exterior and set new standards for your neighborhood homeowner association.